At Markovina Estate we take great pride in providing a great dining and food experience for all our events, we give you the choice of a full plated sit down meal, buffet or shared platters menu. We also offer canapes menus if want your guests to have a more informal experience rather than being seated for their meal. Our beverage package includes wine, beer and non-alcoholic refreshments for you and your guests throughout the day. Our menus cater for gluten free, dairy free and vegetarian guests and we can also accommodate any other dietary requirements. We also have the option of a plated meal available. 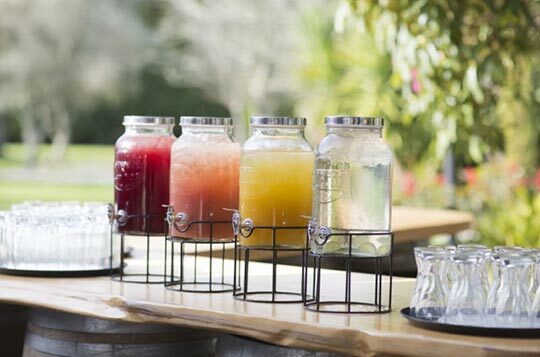 On arrival, your guests are greeted and welcomed on to the Estate, with a selection of refreshing beverages. Including juice, water & our selection of wine & beer. Guests are welcome to explore our property or simply enjoy the company of their friends and colleagues. While you are relaxing a delicious range of canapés letting you relax and enjoy the hospitality and expansive gardens that Markovina Estate has to offer. We also have a selection of games you can enjoy including petanque, croquet and giant jenga. As a part of our event packages, our tasty range of canapés, main meal and dessert selection are all included. Our canapés and dessert selections are the same for each menu type, however you can choose to have our popular buffet meal or our enjoyable platters service, which is like a mini buffet served to each table, for your main meal. We are also able to provide a plated dinner service. Our buffet menu allows you to have a greater choice in creating your individual menu and more freedom with your table design, as you are not limited by the selection of platters being delivered to your tables. As our most popular menu selection, the buffet is fast moving and provides a variety of dishes for your guests to choose from. The platters menu means your guests can enjoy the ambience of your special day while their meal is presented to them. With this choice your guests are not limited by one particular menu selection and can indulge in an impressive array of menu choices offering a large variety. We are also able to offer flexible pricing on plated menus, which gives you the opportunity to create the perfect menu for your event. To provide the perfect finish to your meal, we serve a selection of individual sweet treats for your guests to indulge in. 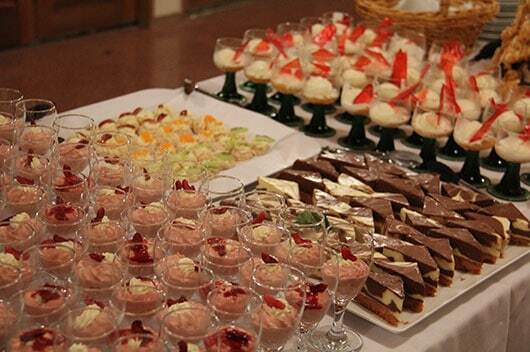 This is served as a buffet, together with a fresh fruit platter and cheese selection. Tea and coffee is also available throughout the day. We ensure that every one of your guests is fully satisfied and had plenty of energy to dance the night away. 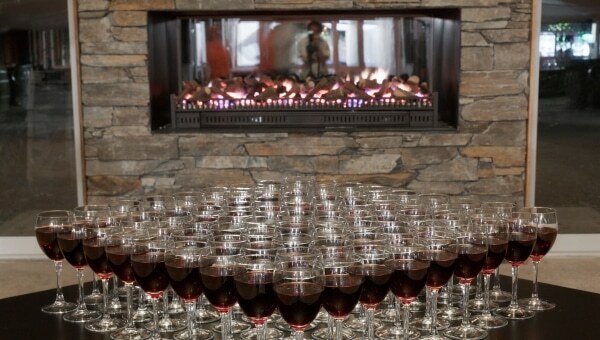 Included in most of our event packages is our popular beverage selection. For our inclusive package the beverage package is included in the per-person price for four hours, and includes our standard selection of wine, beer and non-alcoholic refreshments throughout your stay. There is no predetermined limit on the amount of beverages that are included. Remember your are there to enjoy and indulge but not overindulge, we do not serve intoxicated or under age guests. 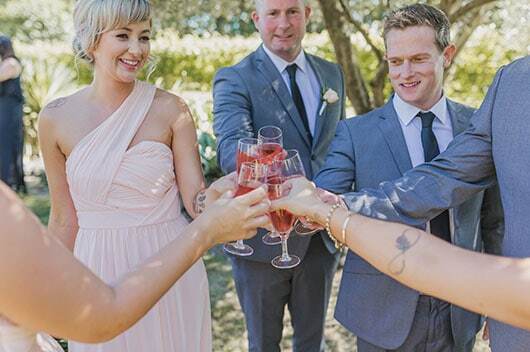 If you have a special bottle of bubbly you would like to open on the evening, we can arrange this for your bridal table, otherwise unfortunately we do not allow any other BYO beverages. Can we bring in our own caterers? We do have our own kitchens and chefs onsite, so we do not allow outside catering. However, you are welcome to use your own suppliers for your wedding cake and guest favours. If you would like a special dish on your menu, please contact us. How much alcohol is included in the package? There is no predetermined limit on the inclusive beverage package. However, we will not serve intoxicated persons or minors. 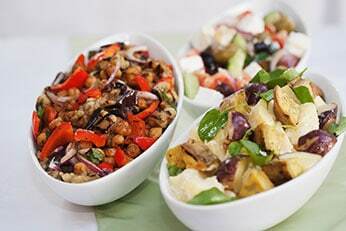 Does your menu cater for gluten free, dairy free and vegetarian guests? Yes, we do have specific dishes available in each of our menus to cater for these requirements. We can also cater for other specific requirements when requested.